Scottsdale's Sherri Bronson recently finished fourth in both women's singles and doubles at the USTA Women's 40 and 50 Indoors in early June at the Wimbledon Racquet Club in Saint Claire Shores, Michigan. 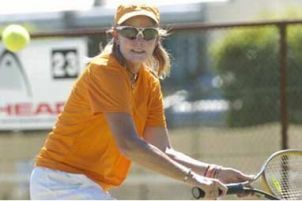 Bronson, a regular competitor on the USTA National	and International Tennis Federation (ITF) Senior	circuits, had a stellar tournament	in Michigan,	her best result in 2008 so far. In singles, Bronson, the third seed,	won two rounds before falling to top-seed and eventual winner	Susan Wright (Grand	Junction, Colo.)	in the semifinals, 6-3, 6-2. Bronson had defeated her previous two opponents in	straight sets. In a tight third place match, Bronson came up a bit short, falling 4-6, 6-3, 6-2 to Suzanne Lippe-Seigler (Boca Raton, Fla.). In doubles, Bronson paired with Leslie Murveit (Portola Valley, Calif.). The second-seeded duo advanced two	rounds and reached the semifinals before falling to Joanne Russell (Naples, Fla.) and	Lynn Taylor (Timonium, Md.). Bronson is currently ranked No. 27 in the World ITF Senior Rankings, and is currently ranked No. 6 in the nation in women's singles. Goodyear, Arizona	resident Eve Shank also competed at the event, reaching the quarterfinals	in singles. Shank also won the backdraw to finish in	fifth place. The tournament was held June 4-8. To view complete results from the tournament, click HERE.